Mothers. Fathers. Brothers. Sisters. Grandparents. Uncles and aunts. Friends. Coworkers. Cancer affects the lives of so many people close to us. In fact, 1.6 million people in the US will be newly diagnosed with cancer this year alone. It is a staggering statistic. But there is hope. 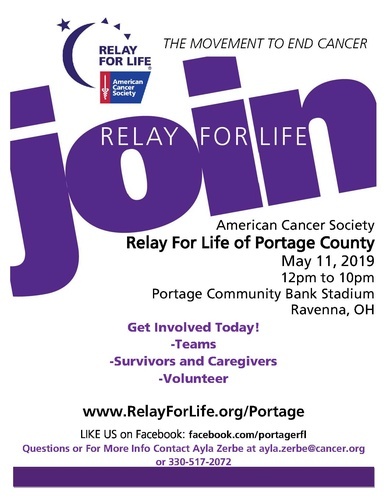 This year, more than 300 people in Portage County will come together to fight back against cancer through the American Cancer Society Relay For Life movement, the world’s largest and most impactful fundraising event to end cancer. Dollars raised help the American Cancer Society save lives by supporting education and prevention efforts, funding groundbreaking cancer research, and providing free information and services for people with cancer who need them. As a vital member of our community, we would love for you to join our Relay For Life event. We have so many options for involvement that we would love to share them with you. You can find them listed below along with our upcoming event information. If there’s something that peaks your interest and you would like more information about, please don’t hesitate to reach out to our Portage County Relay Event Director, Stephanie Stankiewicz at ssfires@aol.com, or American Cancer Society Staff Partner, Ayla Zerbe. Register a Survivor/Invite Survivors to our event. Promote the event. Fliers and resources available. Purchase a luminaria in honor or memory of a loved one. Attend our Relay on May 11th. Cancer touches so many people in our community. The Relay For Life movement presents a great opportunity to celebrate people who have battled cancer, remember loved ones lost, and take action to finish the fight once and for all. We hope you’ll consider joining us for Relay For Life 2019.